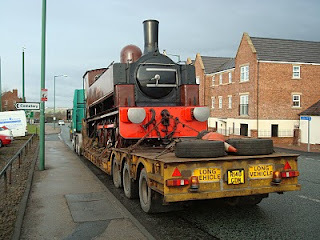 On Saturday we took A No.5 (on loan from Tyne & Wear Museums Stephenson Railway Museum site) to Consett, then brought it to Beamish (its former owner!) where it is on display at the station. As seen elsewhere in this blog we have borrowed Bowes’ Planet diesel to shunt the engine into the RMS every day (we don’t leave it out overnight!). Below: A brief pause for breakfast in Stanley adjacent to the West Stanley Pit Disaster memorial. Below: Parked outside Derwentside College, Consett. Below: On display at Beamish – a rare burst of sunshine! Below: The traditional low 3/4 view! Below: The same display, but this time in this morning’s frost.